Beginning below are five pages from the sketchbook referred to in the quote. The first page shows a sketch of a bush overlooking a salt marsh. It was used as one of the elements in Costal Marsh / South Carolina. The page also shows a sketch from a visit to The Renwick, Washington, DC. 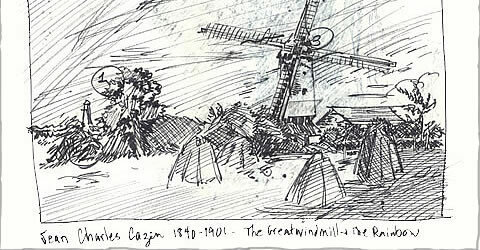 You see a pen sketch with notes of Jean Charles Cazin painting. 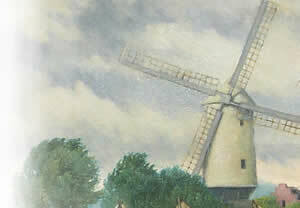 The inset is a picture of an oil study done later using the sketch and notes as a guide see detail. Larger view of the part of an 18" X 24" oil on canvas study done from sketchbook notes (page up to small view of full canvas). The page below shows the palmetto palm sketch used to create Costal Marsh / South Carolina. The note says ... Wild S. Carolina palmetto - Wando River area near Charleston 9/77. 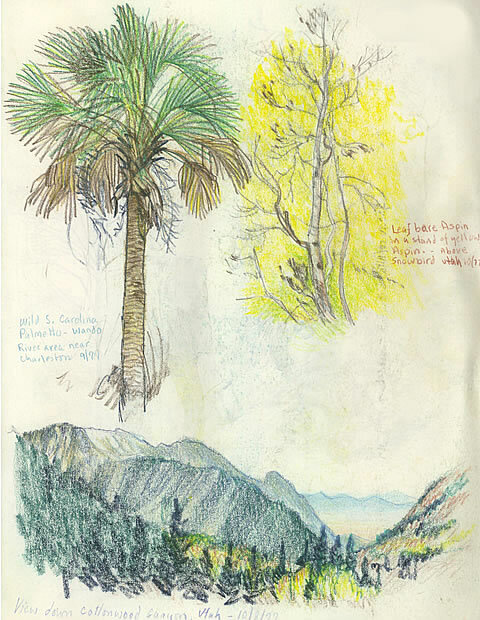 The other two sketches on the page were done in mountains east of Salt Lake City, Utah. October 8, 1977. One sketch is a study of a leaf-bare aspen and the other is a view looking to the west through Cottonwood Canyon towards the Great Salt Lake. The bottom sketch was added in 1992. A fading felt-tip pen was used to sketch a picnic table outside Bozeman, Montana.